Annemarie Hyde has been doing some research around boys writing. She shared this in a recent blog post. 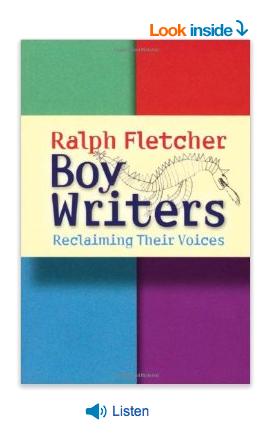 Boy Writers- Reclaiming Their Voices- by Ralph Fletcher I would like to get hold of the book as it sounds like a good read. In a series of short chapters, ideal for after planning quick reads, Fletcher outlines his findings, anecdotes and reflections, ending each with a list of "What Can I Do in My Classroom?" He leaves us with four main points to better nurture and support struggling boy writers. 2. Take the long view - you want them to want to be writers. 3. Consider pleasure. Is it fun? 4. Think relationships. "We're not teaching writing - we're teaching writers."